Dragonflies have to be my favourite insects. Their sleek, colourful styling is more like a futuristic spacecraft than an ancient insect species. In the summer, dragonflies seem to thrive around British Columbia. This was one of a pair that were flying around a reed bed on the edge of Whiteswan Lake in the Kootenay region of Southeastern BC, not far from the Alberta border. We visited this area in August 2005, our first summer in Canada, on our way back from a stay in Edmonton. 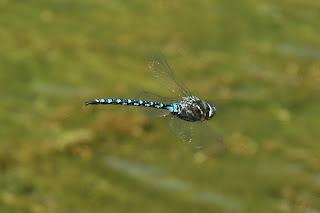 I stood in the water on the edge of the lake and just waited for the right moment as the dragonflies hovered around, darting from side to side. I seem to remember things weren't helped much by two young boys chucking things in the lake from the water's edge. Still, dragonflies aren't scared easily and so I managed to get some nice pictures.